Seth Johnson and Paul Peschisolido are two of five first-team players set to leave Derby before the start of the side's Premiership campaign. Danish winger Morten Bisgaard, defender Paul Boertien and goalkeeper Lee Grant are also being released by the side who won the Championship play-offs final. 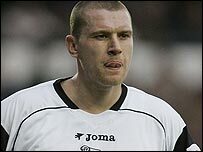 Johnson, 28, made 146 appearances for Derby over two spells - with a £7m move to Leeds coming in between the periods. Peschisolido, 36, arrived at Pride Park in March 2004 from Sheffield United. Young players Steven Cann, Lionel Ainsworth and Tom Cumberworth will also be leaving the club.